There’s a lot of focus on how mums feel in the 24 hours after baby arrives. Usually in a hospital, we’re surrounded by support and know what to expect when it comes to meeting our baby and the crazy, whirlwind emotions that go with it all. But what about dad? For months he’s been watching your bump grow and talking to a little person inside it, imagining what he or she is going to be like. 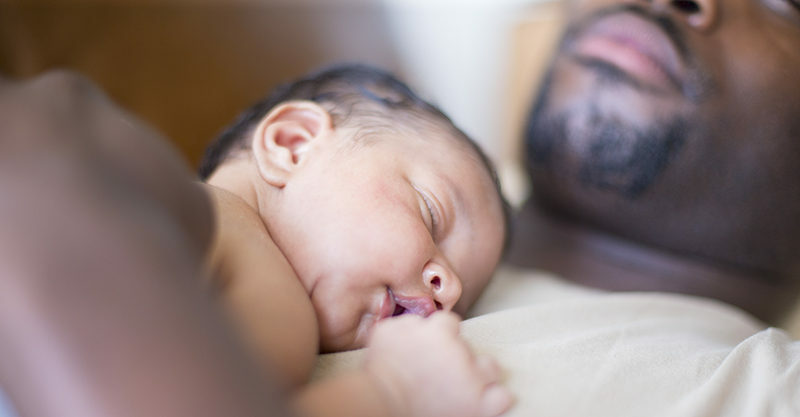 What’s it like for a dad to meet his baby for the first time – and how does a dad feel after the whole birth scenario? Having had many conversations with my husband over the years about the births of our children, it’s fair to say that having a baby is a massive deal for any man – and a fairly intense one at that. These are some of the feels your partner will experience after the birth of your baby. Watching you give birth can be a beautiful thing for some men, but for others, it can be a really scary time, especially if things don’t go to plan. Despite going to all those birth classes, the delivery room is an intimidating scene for blokes, who might feel helpless during the labour and birth process. Watching you in pain, and not being able to take that away, plus wondering if everything’s going to be okay can leave a man feeling pretty terrified and helpless. When your baby arrives, and everyone is okay, he’s likely to feel some big relief. Labour can be such a worrying time for dads, who can’t really do much to help the process, apart from rubbing your back and feeding you ice chips. And if your birth took an unexpected turn or two, requiring intervention such as an episiotomy or emergency c-section, this will have been one rollercoaster ride he’ll be happy to get off. The birth might be over, but the overwhelm doesn’t necessarily stop there. He might have watched your bump grow all those months and fantasised about holding his baby, but the actual live event can be something out of this world. Looking down at that little person, and knowing that its survival depends on him… it’s big. In a daunting yet wonderful way. He’ll look at you like you’re some sort of hero. He’s just watched you go through a long, painful labour, during which your body did things he’d never imagined before. You birthed an actual baby – his baby – how can he feel anything but total and utter wonder of you? Not only did you build his baby in your body, but you got it out into the world safely for him. To him, you’re the mother of his child and a true warrior. His baby is finally here. He gets to call himself a ‘dad’ and can start planning all the games and fun stuff that dads do with their kids. Whether he’s cradling a little prince or princess, he’s going to be imagining all the adventures that lay ahead and can’t wait to get started. In fact, he’ll probably want to get you both home as quickly as possible so he can start looking after his little family. There’s something about having a baby that brings two people closer together than ever before. For months and months, you’ve talked about your baby arriving, and when it finally happens, it’s more intense and crazy and magical than you ever imagined. It’s the greatest adventure the two of you will ever have, and the little person that comes with it will bind you closer together and never let you forget it. And when he first locks eyes with that baby, he’ll be bowled over by the little person staring back at him, a perfect little combination of the two of you.